To keep making progress, adopt a progressive training method. You're doing your same exercise routine, but finding that the quick results you once saw are not happening anymore. Take a minute to congratulate yourself -- this is a sign that you've been working hard. Now the part that's a bit tougher to swallow. When your body has adapted to the demands you're putting on it, you'll need to increase the intensity of your workout, often called "progressive training," in order to keep gaining strength and building muscle. Typical progressive exercise plans include increasing the number of reps or sets, and then increasing the amount of weight. Do the bicep curl exercise with a set of dumbbells to which weight can be added. Move up 1 pound from the weight you used last time you did bicep curls. If you've been using a 10-pound weight, move up to 11. 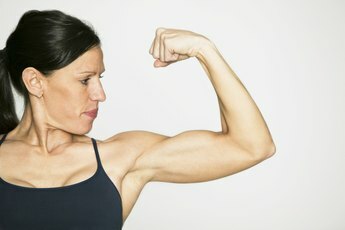 Alternate arms, first lifting the right arm and then lifting the left arm until you've done eight repetitions of the bicep curl exercise on each arm. Pause for 60 seconds after the first set, and then complete a second set of eight repetitions for each arm, alternating arms. Do this routine twice in one week, with at least 24 hours of rest in between arm workouts. Increase the number of repetitions the second week. Instead of eight repetitions on each arm, do 12. Continue to alternate arms as you do the exercise, and continue to take a 60-second break in between the two sets. Do this routine twice in one week, with at least a 24-hour break in between. Increase the number of sets you do on the third week. Do three sets of eight repetitions, continuing to alternate arms. Take a 60-second break in between each sets. Do this routine twice a week for two weeks, with at least a 24-hour break in between. Choose a third day on the second week of this progression and increase the number of repetitions to 12 for each of the three sets. Do three sets of 10 to 12 repetitions on the fourth week, but this time, lift both dumbbells at the same time. This gives your muscles less of a break in between lifts and increases the intensity of the workout. Do this exercise twice in one week, giving yourself at least 24 hours' rest in between workouts. Increase the amount of weight you're lifting by 1 pound, and then start with the same progression you began with in Step 1, starting with two sets of eight repetitions, moving up to 12 reps, and so on.